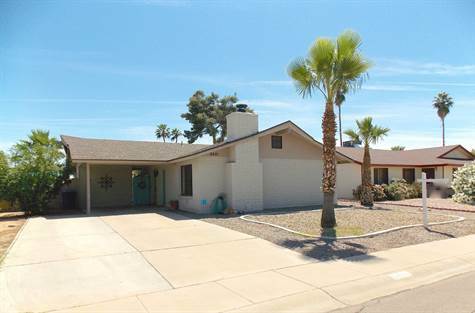 Knoell Tempe, Tempe - The location couldn't be better in this charming home located in the popular community of Knoell Tempe. The home features a roomy great room with cozy fireplace and a light & bright kitchen and dining area. The kitchen boasts a stainless sink and dishwasher, electric range and an island with breakfast bar. Additional guests can be seated in the roomy dining area. There are three nice sized bedrooms each with ceiling fans and overhead lighting and two full baths. Enjoy peace of mind knowing that a new roof was installed just a year ago. Lovely french doors lead to the gated side yard where you will find a covered patio & storage shed/laundry. The south facing back yard boasts a diving pool and easy care landscaping with room for entertaining and relaxing. Situated in a quiet and well kept neighborhood with no HOA that is conveniently located near the 101 and 60 freeways, ASU & Mesa Community College, and all the dining, entertainment, and shopping that Tempe has to offer. This one won't last long! I really love this house.There is nothing on the planet as sweet as a home". 'East or West, home is the best' as the truism goes. Home is the image of human harmony a place where every one of us take in the initial steps of life. I really like this house which is located in beautiful area. I have read an article about current condition of real estate market at http://www.essayuniverse.us/bestessay-com-review/. It is really hard to find these facilities of house.